Kellogg’s Special K makes 30 different products. Special K Cracker Chips Cheddar and even Special K Flatbread Morning Sandwich. All Kellogg did was win 11 straight — including a no-hitter against the No. 3rd-ranked Oregon State Beavers — before losing his final outing of the year. He was 11-1 with a 3.15 ERA to win Canadian Baseball Network Player of the Year honours, the best of the 754 Canadians playing the majority of their schedule south of the border, in voting for the 14th annual Canadian Baseball Network all-Canadian college team. Kellogg had more first-place votes — 50 of 65 — edging outfielder Emmanuel Forcier (St-Hyacinthe, Que.) of the New Mexico JC Thunderbirds, who had 48 and catcher Jordan Procyshen (Calgary, Alta.) of the Northeastern Plainsmen, who had 47, for the top honour. — 2B Maxx Tissenbaum (Toronto, Ont.) of the Stony Brook Seawolves last year. — OF Chase Larsson (Vancouver, BC), Cameron Aggies in 2011. — OF Marcus Knecht (North York, Ont.) Connors State College Cowboys in 2010. — 3B Jesse Sawyer (Calgary, Alta. ), South Dakota State Jackrabbits in 2009. — DH Mike Gosse (Pitt Meadows, BC), Oklahoma Sooners in 2008. — 1B Kevin Atkinson (Surrey, BC), New Mexico Jr. College Thunderbirds in 2007. — OF Jon Baksh (Mississauga, Ont. ), Florida Tech Panthers in 2006. — C Aaron McRae (Delta, BC), LSU-Shreveport Pilots in 2003. — OF Ryan Kenning (North Vancouver, BC), New Mexico State Aggies and RP-SS Jesse Crain (Toronto, Ont. ), Houston Cougars, who shared honours in 2002. — LHP Jeff Francis (North Delta, BC), British Columbia Thunderbirds in 2001. Our voters included ... 22 coaches, from elite programs to colleges on both sides of the border; 12 scouts, 10 of our CBN writers, six suits (executive, GMs, front-office staff, statisticians), six former players, half of them former All-Canadians, four other writers, four broadcasters and one agent. To start the season Kellogg beat Bethune-Cookman Wildcats working four scoreless innings of relief. Then, in his first start he beat the Tennessee Volunteers, allowing one run in five innings before 2,355 fans at Lindsey Nelson Stadium in Knoxville. Next came wins over Long Beach State Dirtbags, Washington State Cougars and a no-hitter against third-ranked Oregon State Beavers to move to 5-0. Then, he beat fourth-ranked UCLA Bruins, the 11th-ranked Oregon Ducks, Southern Cal Trojans, Valparaiso Crusaders and the Utah Utes to go to 10-0. He beat Washington again moving to 11-0 and then lost 1-0 to 3rd-ranked Cal State Fullerton Titans. 1. Pac-12 Pitcher of the Week in April after pitching a no-hitter, beating third-ranked Oregeon State 4-0. 2. Louisville Slugger Player of the Week for the Oregon State win. 3. NCBWA National player of the week as well. 7. All-Pac-12 Conference first team honours. 9. NCBWA Freshmen All-American second team honours. 10. Louisville Slugger All-American second team honours. 11. Louisville Slugger Freshman All-American. 12. Named to College Baseball HOF Pitcher of the Year Watch List. 15. Canadian Baseball Network Player of the Year. Our first-team features six players from Ontario and five from Alberta, as well as one each from British Columbia, Saskatchewan and Quebec. Our first, second and third teams combined, with ties, include 21players from Ontario and 11 from Alberta. The rest of the representation came from BC (four), Quebec (three) and Saskatchewan (one). Totaling the first three teams and the honourable mentions players from eight provinces were represented led by Ontario with 61 players. British Columbia was next with 19, followed by Alberta (16), Quebec (eight), Manitoba (three), Saskatchewan (two), with Nova Scotia (one) and PEI having one each. Left-hander: Ryan Kellogg (Whitby, Ont.) Arizona State Sun Devils. Kellogg’s only loss came against third-ranked Cal State Fullerton Titans in Game 2 of the NCAA Fullerton Regional. He allowed one run in 6 1/3 innings as he was touched for the only run of the game in the bottom of the seventh. Kellogg became the first Sun Devil freshman in school history to begin 11-0, the fourth arm in ASU history with at least 11 wins as a rookie and he also threw the ninth no-hitter in school history — and first in 20 years. His 103 innings pitched are the fifth most for a freshman in school history and his 3.15 ERA, fourth lowest on the team, ranks among the top 10 lowest by an ASU freshman. Kellogg walked 17 and struck out 54, holding opponents to a .246 average. He was only the fourth Sun Devil in school history to earn freshman All-America honours from three or more publications, joining Brady Rodgers (2010), Mitchell Lambson (2009) and Mike Leake (2007). Kellogg was third in wins amongst Canadians, three behind Alex Reagan and two back of Andrew Cooper. He was four outs shy of Regan for the innings lead. Kellogg pitched for the Rob and Rich Butler’s Ontario Prospects. Right-handers (tie): Andrew Cooper (Belle River, Ont.) Sierra Wolverines and Tim Black (Mount Hope, Ont. ), North Iowa Area Trojans. Cooper led all California Community College pitchers in wins this season compiling a 13-3 record with a 2.65 ERA in 18 games, making 16 starts. He recorded 56 strikeouts in 98 2/3 innings. Cooper earned Big 8 Conference pitcher of the year honours in the California Conference and earned All-American honours. The Washington Nationals chose Cooper in the 12th round this June and he signed. Cooper was second in most wins by Canadians, one behind Alex Regan. Besides playing for coach Rob Wilson, who converted him to the mound after Cooper arrived in California as a shortstop, he played for the Tecumseh Thunder and coach Dave Cooper. Black fanned a NJCAAA Division II single-game World Series record 16 batters in 2-0 win over Madison in the opening game of the nationals. He had a 6-3 record with a 1.99 ERA during his sophomore season striking out 78 and walking 24 in 72 innings, setting single-season records both in strikeouts and ERA. Black appeared in 12 games, making 11 starts, as he held opponents to a .201 average. Black, who transferred to Central Michigan, holds NIACC program records with 132 career strikeouts and a career earned run average of 1.88. He was selected to the NJCAA Division II World Series all-tournament team. Black was third in strikeouts, five behind Rory Young and four back of Rob Zastryzny. Black played for the Hamilton Cardinals and coach Gord Thompson, as well as Schroeder Nicholls and the legendary Dean Dicenzo. Reliever: Jon Fitzsimmons (London, Ont.) Canisius Golden Griffins. Fitzsimmons, a two-time MAAC Relief Pitcher of the Year, was 4-0 with 10 saves and a 1.16 ERA in 21 appearances during the 2013 season. He had 38 strikeouts in 31 innings and held opponents to a .154 batting average. The 6-foot-2 right-hander recorded two outs — both strikeouts — of No. 1 seed North Carolina in the NCAA Tournament. He also pitched the ninth inning in the combined no-hitter of Iona College, the first nine-inning no-hitter in program history. In his three-year career Fitzsimmons made 56 appearances and posted 22 saves with a 7-3 record and 1.88 ERA, recording 85 strikeouts in 67 innings. He held the opposition to hit .185. Fitzsimmons was not drafted, but pitching for Wilson Tobs of the Coastal Plain League this summer, he was signed after he struck out the side in the all-star game, impressing a Kansas City Royals scout. In eight appearances Fitzsimmons had six saves, allowing one run while striking out 12 batters. 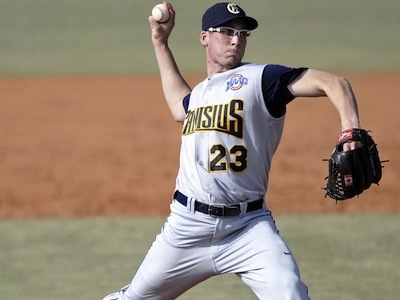 Fitzsimmons, who pitched for Canisius coach Mike McRae and Mike Lumley’s London Badgers program, earned 2012 Canadian Baseball Network First Team honours. He was the only player to be a repeat performer on the 2013 All-Canadian college team from last year. Catcher: Jordan Procyshen (Calgary, Alta.) Northeastern Plainsmen. Procyshen hit 15 home runs, which tied him for first place in the nation with freshman teammate J.J. Bissell. His .418 average was 21st in the nation and he was tied for 10th in the nation in RBIs with 65. He helped NJC to a 40-21 mark, the Empire Conference crown and the Region IX Tourney title for the second time in the program’s history. For the first time ever NJC hosted the Western District tournament before bowing out. Procyshen was 4-for-8, with three homers and 10 RBIs in two games against Western Nebraska. Procyshen had 21 doubles, three triples with a .750 slugging percentage, a .475 on-base mark and a 1.225 OPS. Born in Guelph, Ont., Procyshen was named All-Region, All-District this spring and became the first-ever member of the NJC program to achieve First Team All-American status. He has transferred to Northern Kentucky University. He shared the home run lead with Joel Lutz. And along with Chris Shaw and Jeremie Fagnan, was tied for second-most doubles (21) amongst Canadians, one behind Colby’s Matt Benn. Shaw was second in RBIs, five behind Fagnan. Procyshen, who played for coaches Frank Ingram and Vince Ircandia with the Okotoks Dawgs, earned 2012 Canadian Baseball Network Honourable Mention honours. First base: Jeremie Fagnan (Calgary, Alta.) Midland Chaparrals. Fagnan hit a .419 average, ranking fourth in the country with 77 RBIs, compiling a .665 slugging percentage. To top off his memorable season he was named ABCA/Rawlings NJCAA National Player of the Year. He hit six home runs, 21 doubles and ranked sixth in NJCAA DI with 11 triples, while excelling on the base paths, stealing 34 bases to rank second with 89 runs scored. Fagnan led the Midland to a Region 5 title and its first appearance in the NJCAA D1 Baseball World Series. The Western Junior College Conference MVP batted 6-for-12 (.500) at the World Series in Grand Junction, Col., with two doubles and six RBIs. Before Midland was eliminated in the 10th inning of their third game by Palm Beach State, he forced extras with a two-run double in the bottom of the ninth. Fagnan earned first team All-America honors after his average topped the Southwest District, earning a Rawlings NJCAA Big Stick award with a 1.178 OPS. He led all Canadians in RBIs with 70 and led in stolen bases with 30. Fagnan, Chris Shaw and Jordan Procyshen were tied for second-most doubles (21) amongst Canadians one behind Colby’s Matt Benn. He was second to Emmanuel Forcier with 10 triples. Fagnan, who played for coach Les McTavish and the Vauxhall Academy Jets, earned 2012 Canadian Baseball Network Honourable Mention honours. Second base: Troy Black (Mississauga, Ont.) Maine Black Bears. Black hit .363 in 54 games. He had five doubles, two triples, a homer and 24 RBIs to go with an .843 OPS as well as going 13-for-16 stealing bases. Black earned America East Player of the Week honours batting .692 (9-for-13) in three games for the Black Bears with five RBIs and five stolen bases against UMBC Retrievers. Black slugged .923 to go along with a .733 on-base percentage. In game one, Black went a perfect 3-for-3 with a walk and an RBI while also stealing a pair of bases. Next, he was 3-for-5, with a double and a triple, driving in four, stealing two more bases. And in the finale he was 3-for-5 stealing his fifth base of the weekend. Black, who played for Team Ontario and coach Murray Marshall, earned Canadian Baseball Network Honourable Mention honours in 2011 and 2012. Third base: Joel Lutz (Medicine Hat, Alta.) Lubbock Christian Chapparals. Lutz appeared in 60 games hitting .333 with a team-best 63 RBIs. He ranked second on the team and in the NAIA in home runs with 15 and ranked sixth in homers per game, seventh in RBIs (63) and ninth in total bases (134). He produced a streak of reaching base safely in the first 40 games and was ranked second in the SAC with runs-batted-in per game (1.09). He was fourth in the NAIA this season and was also ranked in nine other statistical categories. He earned NAIA All-America teams Honourable Mention and West Group first team honours. He and Jordan Procyshen tied for home runs amongst Canadians with 15 each. Lutz, who played for Muscataine Cardinals and coach Dave Barb, the Medicine Hat Monarchs and coach Lovell McDonnel, earned 2011 Canadian Baseball Network First Team honours. Shortstop: Tyson Popoff (Richmond, BC) British Columbia Thunderbirds. Popoff set a single-season batting average record for UBC as he finished the year at .401, breaking Mark Capone’s .390 mark from 2005. He was named a Gold Glove winner for his outstanding defensive play (.975 fielding percentage in 38 games). A transfer from Salt Lake Bruins, he won the NAIA West Red Lion Player of the Week leading the Thunderbirds to three wins in four games against the Simpson Red Hawks. Popoff went 9-for-18 with seven RBIs. His hits included two doubles and a home run. He earned a berth on the All-NAIA West Team. Popoff, who played this season for coach Terry McKaig, played for Jason Rich during his formitive years with the North Delta Blue Jays, which produced the likes of Justin Morneau and Jeff Francis, who both went on to successfucl major-league careers after playing for coaches Ari Mellios and Mike Kelly. Outfielders: Emmanuel Forcier (St-Hyacinthe, Que.) New Mexico JC Thunderbirds, Cole Bauml (Marysburg, Sask.) Trinidad State Trojans and Brendan Miller (Taber, Alta.) McPherson Bulldogs. Forcier helped the Thunderbirds to a second place finish in the Western Junior College Conference in 2013, hitting .407 with six doubles, 18 triples, seven home runs, and 47 RBIs. He was first in the nation in triples and 792nd in doubles. When he arrived he learned English and then he learned how to hit line drives into the gap. The park in Hobbs N.M. does not have any nooks and crannies which lead to odd bounces creating triples. Plus by going 10-for-14 stealing bases, it’s obvious Forcier is not the next Tim Raines or Jacoby Ellsbury. But 18 triples ... are 18 triples. He had 26 RBIs with a .389 average in 2012, his first year at New Mexico JC. This spring he had a slugging mark of .796 and a 1.288 OPS and has now transferred to Oral Roberts. Forcier led all Canadians in triples (18). Forcier, who played for Josh Simpson with the Thunderbirds, Phil Tomlinson at College Lafleche in Trois-Rivieres, Mike Goyette, les Ailes in 2009, pro scouts Alex Agostino and Ray Callari at the peewee level along with the likes of Louis Domingue, a draft pick of the Phoenix Coyotes and Mateo Agostino, now a provincial hockey referee and doing midget-AAA and junior Tier II, earned 2012 Canadian Baseball Network Third Team honours. At the peewee nationals in Quebec City in 2007, Bauml was voted the best shortstop in the tournament. Now, he’s one of the best outfielders playing NCJAA Div. I and the second most popular Canadian outfielder amongst voters when it comes to our all-Canadian team. He hit .375 with 13 doubles, six triples, six homers and 38 RBIs. He had a 1.084 OPS. On the base paths he was 15-for-17 stealing bases. Bauml was the first Trojan from the prairies to earn All-American honours since Kip Simon (Regina, Sask.) in 2003. Bauml, who played for Team Saskatchewan, coached by Greg Brons and Roger Anholt, as well as the Saskatoon Giants coached by Ron Bauml and Mark Dolan. Miller batted .391 with 11 doubles, a triple and eight homers with 56 RBIs. He had a .909 OPS stealing bases 13 times in 17 tries. He had three-hit games against Robert Morris and Saint Mary (twice each), plus Manhattan Christian, Ottawa, Friends and Bethany. Miller earned KCAC Player of the Week in the first week of April, hitting .643, slugging 1.429 in five games to earn his second consecutive award. In the first two games of a four-game series against Ottawa, Miller was perfect at the plate, 5-for-5, drawing two walks, scoring five times and knocking in five runs as the Bulldogs split with the Braves winning 11-6 and losing 3-1. During the second doubleheader, Miller was 4-for-6 and drew three walks as McPherson defeated Ottawa in both games 19-1 and 6-5). He finished the week with nine hits, nine runs, nine RBIs, five walks, two stolen bases, and a homer. Miller, who played for coach Les McTavish and the Vauxhall Academy Jets, earned 2010 Canadian Baseball Network Honourable Mention honours. DH: Daniel Telford (Newmarket, Ont.) South Dakota Jackrabbits. Telford hit .410 with six home runs and 36 RBIs as he earned South Dakota’s MVP and added two other accolades at the year-end awards. He claimed the Coaches award and Big Stick award during an all-Summit League season in 2013. Telford’s average and home run total led the team, as did his .680 slugging percentage, while his 36 RBIs tied for the team lead. Telford was a first-team all-Summit League selection, was named MVP of the Summit League championship (going 7-for-17 .412, with three doubles, a homer and five RBIs), helping lead the Jackrabbits to their first-ever NCAA Tournament appearance at the Division I level and earned ABCA All-Midwest Region second team honors. Telford played for coach Danny Bleiwas and the Ontario Blue Jays. Left-hander: Alex Regan (Calgary, Alta.) Mount Olive Trojans. Regan went 14-1 to tie for first in the nation in wins. He beat the Belmont Abbey Crusaders (twice), Lenoir-Rhyne Bears, Newberry Wolves, Le Moyne Dolphins, Barton Bulldogs, King Tornado, Coker Cobras, California (Pa.) Vulcans, Erskine Flying Feet, Limestone Saints, Pfeiffer Falcons, Winston-Salem State Rams and Lincoln Memorial Railsplitters. He lost to North Greenville Crusaders. In Regan’s 9-3 win over Lincoln Memorial, he worked eight innings allowing three unearned runs as he struck out seven in the NCAA Division II Southwest Regional. With the win he tied a school single-season wins record. He had a 1.81 ERA and tied for 10th in the nation with seven complete games, including two nine-inning complete games, with a win against nationally-ranked California (Pa.) as he allowed only one unearned run. On the season, he allowed 16 walks and struck out 58 in 104 1/3 innings, earning NCCSIA Baseball All-State first team, as voted on by members of the North Carolina Collegiate Sports Information Association and earned All-American Third Team honours. Regan led all Canadians in wins, one more than Andrew Cooper. He led all in innings pitched at 104 1/3 innings. Regan played for Todd Hubka at the Prairie Baseball Academy Dawgs as well as coaches Matt Ircandia, Frank Ingram and Don McLeod with the Okotoks Dawgs. Right-hander: Dave Hatt (Toronto, Ont.) Wilmington Wildcats. Hatt was 7-1 with a 2.08 ERA — second best in his conference — in 16 starts. Batters hit .212 against him. He threw a complete game shutout against Felician, striking out a season-high nine in the 1-0 victory. Hatt walked 18 and struck out 56 in a conference-high 91 innings, going 7-0 in 13 league starts. Hatt finished his Wildcat career by tossing three scoreless on two days rest starting the NCAA Division II East Region championship against Franklin Pierce. After transferring to Wilmington from Burlington County College, Hatt tossed 167 2/3 innings over two seasons making 31 appearances and 26 starts. In 15 decisions, Hatt went 12-3, tossing three complete games and was a part of five shutouts through his two seasons. Including a 1.76 ERA as a junior, Hatt finishes his Wilmington career with a 1.93 ERA, striking out 101 in his career, and walking 34 hitters. He was named First Team in all four post-season organizations in the NCBWA, ABCA, Daktronics, and Central Atlantic Collegiate Conference, including the NCBWA East Region and CACC Pitcher of the Year awards. The CACC Pitcher of the Week, the Chi Alpha Sigma Honor Society Inductee; Wilmington Academic All-Star earned first team All-conference honours and was named the CACC Pitcher of the Year. Hatt pitched for the Waterdown Wolves, Burlington Bulls and coach Al Montgomery of the Niagara Rebels. Closer: J.D. Moore (Mississauga, Ont.) South Dakota Jackrabbits. Moore set a school single-season record with 13 saves, which also was tops in the Summit League, to earn the Fireman Award. The right-hander struck out 38 batters, walking 14, in 31 2/3 innings with a 1.99 ERA. As the Jackrabbits won the Summit League tournament title with a 1-0 win over North Dakota, Moore earned first-team tournament team honours. Moore pitched a scoreless inning in an 8-4 win over the Oakland Grizzlies, 1 1/3 scoreless in a 5-4 win over Western Illinois Fighting Leathernecks and another 1 1/3 scoreless in a 2-0 win over North Dakota State. Altogether 3 2/3 innings without a run. He was named to the All-Midwest Region Team by the American Baseball Coaches Association. He made a team-high 26 appearances, limiting opposing hitters to a .175 batting average. Moore pitched for coach Danny Bleiwas and the Ontario Blue Jays. Catcher: Chris Shaw (Winnipeg, Man.) Midland Chaparrals. Shaw’s third inning grand slam helped Midland down Grayson County College 8-2 — as RHP Jeremy Filipek (Langley, BC) pitched a complete game — to win the NJCAA Region V Tournament for a berth at the JUCO World Series in Grand Junction, Col. Shaw was 2-for-4, adding a single. He hit .267 with two doubles, a homer and four RBIs. Shaw hit .372 with 21 doubles, four triples, 10 homers and 61 RBIs, slugging .716. At the JUCO World Series he was 3-for-9 with a double and an RBI. Outside of the clincher, Shaw’s best game might have been a 16-15 winner over Luna as he went 4-for-5, including a homer, with three RBIs. Shaw, Jeremie Fagnan and Jordan Procyshen were tied for second-most doubles (21) amongst Canadians one behind Colby’s Matt Benn. He played for coaches Brett Thomas and Allen Cox with the Okotoks Dawgs. First base: Trevor Edwards (Toronto, Ont.) North Carolina-Greensboro Spartans. Edwards hit .287 with 14 doubles, nine triples, 13 homers and 49 RBIs. He earned the Blue Chip Performer award from Blue Cross Blue Shield of North Carolina chosen weekly from all sports. Edwards ended his career with the UNCG in style, hitting a three-run walk-off home run in the bottom of the ninth inning in a 13-11 victory over The Citadel, capping a day he also doubled, knocking in four runs. He ranked first in home runs (13) and RBIs (48) ending up third in doubles (14) and runs scored (42). His 13 home runs were tied for the sixth most in a single season in school program history. He was third in home runs two behind Jordan Procyshen and Joel Lutz. Edwards, who played for the Toronto Mets and coach Jason Chee-Aloy, earned Canadian Baseball Network First Team honours in 2012 and 2011. Second base: Andrew Firth (London, Ont.) UBC Thunderbirds. Firth led the the ‘Birds with 72 hits in 2013, batting .387. He also led with 40 RBIs thanks 10 doubles and a triple, scoring 38 runs. He had six hits and five RBIs in a doubleheader win over Concordia — 4-3 and 9-2 wins — had four hits in a one-run loss to Westmont and was 3-for-4, as UBC fell 5-2 to Seattle. He earned All-NAIA West team honours and was named a 2013 Captial One First Team Academic All-American with a 3.75 GPA. Firth, who played for the London Badgers and Mike Lumley, earned Canadian Baseball Network First Team honours in 2012 and Honourable Mention honours in 2010. Third base: Russell McGibbon (Pickering, Ont.) Niagara County CC Thunder Wolves. McGibbon earned MVP honours as Niagara County won the District A/Region 3 championship and a berth in the NJCAA Division III World Series. McGibbon was 3-for-4 with a homer and three RBIs in an 8-3 win over the Erie Katsm had two hits and drove in a run in a 10-5 win over Herkimer County and had pair of hits and two RBIs in a 5-1 win over Erie. He hit .538 (7-for-13) with six RBIs for the tourney and was selected to all-tournament team. He batted .438 with eight doubles, five triples, two homers and 38 RBIs in 38 games and was a first-team all-region selection. McGibbon played for Rob and Rich Butler’s Ontario Prospects. Shortstop: Cole Peragine (Belle Ewart, Ont.) Stony Brook Seawolves. Peragine hit .289 with one home run and 19 RBIs in 54 games. Besides flashing a steady glove at shortstop, he was the toughest on the team to strike out, fanning once every 10.1 at-bats, the only player on the team to draw more walks than strikeouts. He went 2-for-5 with an RBI and stolen base at Florida International, had three hits and two RBIs at Fordham, had three hits and a stolen base at Albany, went 3-for-5 against Hartford. Peragine hit the tie-breaking two-run homer to lift Stony Brook to a 4-2 win over Fairfield and drove in two runs in 10-3 win at Hartford that clinched a spot in the America East championship. He was named to the America East All-Academic team. Peragine, who played for the Ontario Terriers and coaches Scott Van de Valk, Danny Thompson, Mike Tough and John McEwan, earned Canadian Baseball Network Second Team honours in 2012. Outfielders: Sasha LaGarde (Pierrefonds, Que.) Mercer Bears, Jackson Gooch (Delta, BC) McNeese State Cowboys and Francis Cloutier (Shefford, Que.) Wharton County Pioneers. LaGarde batted .308 with nine doubles, a triple, seven homers and 34 RBIs stealing 15 bases in 18 tries. He helped Mercer with two hits and an RBI in a 13-4 win over Northern Kentucky to win Atlantic Sun title. LaGarde hit a solo homer in extras as Mercer edged the Kennesaw State Bears 4-3 in the 11th. He has 17 two-hit games, three three-hit games (a 9-4 win over the Georgia State Panthers, a 5-4 win over Georgia Southern Eagles and an 11-1 win over the Belmont Abbey Bruins) and one four-hit night (a 9-6 victory over the Miami Hurricanes). He ranked ninth in the nation with 61 runs scored hitting in the lead-off spot. He led the A-Sun with 16 hit by pitches. LaGarde, who played for coach Joel Landry at the ABC. after playing midget in Lachine, earned Canadian Baseball Network Honourable Mention honours in 2012. He owned a .301 average with 15 doubles, a triple, five homers and 34 RBIs for the Cowboys. He hit a two-run homer in the top of the ninth to make a winner of Jason Gibson (Victoria, BC) in McNeese’s 3-1 win over the Oral Roberts Golden Eagles. Selected to Southland second team All-Conference, he was one of the team’s top hitters finishing the regular season with a .308 average. He ranked in the top 10 of the conference in four different categories: hits (64), home runs (five), doubles (15) and total bases (96). Gooch, who played for Lamar Running Lopes coach Scott Crampton, the White Rock Tritons and coach Josh Ridgway, earned Canadian Baseball Network First Team honours in 2012. Cloutier hit .360 with six doubles, five triples, a homer and 21 RBIs in 39 games. He had a .976 OPS. He had two-hit games: a 7-4 win over the Angelina Roadrunners, an 8-4 win over the Temple Leopards, which included an RBI double, a 7-6 win against the Blinn Buccaneers, a 15-1 win over the Schreiner Mountaineers JVs with a double, triple and two RBIs, a 7-1 loss to Galveston Whitecaps, a 15-0 win over the Concordia (Tex.) Tornados JVs, a 10-5 loss to San Jacinto Gators, including a triple, a 4-3 win over Alvin with a double, a 6-4 win against Blinn with two RBIs, an 11-7 loss to San Jacinto with a double and a 3-0 loss to San Jacinto. His best game was a 3-for-4 day in an 9-8 loss to Galveston which included a double and four RBIs. Cloutier was an unanimous All-Region XIV Conference South Zone first team selection. He played for who played for coach Joel Landry at the ABC. after playing in Sherbrooke. DH: Kurtis McCallum (Thunder Bay, Ont.) Mayville State Comets. McCallum hit .388 with nine doubles, three triples, five homers and 41 RBIs while slugging .636, ranking 21st in the nation. He had three hits, including a homer and five RBI in an 8-7 win over Dakota State in the NAIA Unaffiliated Tournament in Jamestown. He had was 2-for-4 with three RBIs in a 19-3 win over Dakota Wesleyan. McCallum had two hits and two RBIs in a win over St. Olaf at the MetroDome in Minneapolis. He earned All-Conference first team honors for the Comets. McCallum, who played for Jason Hart’s Northwest Slam, earned Canadian Baseball Network Honourable Mention honours in 2012. Left-hander: Rob Zastryzny (Edmonton, Alta.) Missouri Tigers. Our voters had Zastryzny third (due to his 2-9 record?) but scouts saw his swing-and-miss fastball and his 3.13 ERA in 13 starts making him the top Canadian selected in the June draft. He had 82 strikeouts in 90 2/3 innings for a career total of 228, tying him for eighth all-time in Mizzou history. He pitched three complete games, including a seven-hit shutout of the Georgia Bulldogs. In his SEC debut against South Carolina he went nine innings, allowing two earned runs and one walk against 10 strikeouts, but lost 2-1. In back-to-back starts against Auburn and Texas A&M, he worked eight innings in each outing, giving up three and two earned runs. Zastryzny was second in strikeouts, one behind Rory Young. Zastryzny, who pitched Missouri’s Tim Jamieson, earned Canadian Baseball Network Second Team honours in 2012. Right-hander: Nick Pivetta (Victoria, BC), New Mexico JC Thunderbirds. The 6-foot-5 Pivetta was 9-2 with a 3.36 ERA over 13 starts in 2013 tossing six complete games and holding opponents to a .235 batting average. Pivetta pitched complete games beating Otero 3-0, defeating Clarendon 14-4, losing 3-1 to Midland, beating the Howard Hawks 6-3, knocking off Odessa 9-1, beating New Mexico Military 8-1. Pivetta popped early with a 97 MPH fastball in fall ball earning him high marks from Allan Simpson of Perfect Game. Pivetta set season highs in six of his seven appearances for the Perfect Game Collegiate League’s Glens Falls Golden Eagles. He was coached by Victoria HarbourCats co-coaches Bob Miller and Dennis Rogers, New Mexico coach Josh Simpson, Glens Falls’ John Mayotte, Marty Lehn at Big League Experience and Gautam Srivastava with the Victoria Eagles. Reliever: Skyler Janisse (Maidstone, Ont.) Salt Lake Bruins. Janisse compiled a 1.74 ERA while going going 3-1 in 14 games. He walked 11 and struck out 36, holding opponents to a .206 average. He had four saves: two each against Bryce Harper’s old school, the College of Southern Nevada and Southern Idaho. Janisse, who pitched for Richard Soloman and Joe Siddall with the Windsor Selects, earned Canadian Baseball Network Second Team honours in 2012. Reeves had shoulder surgery the September before his senior season and then enjoyed his best season. He hit .330 with a .417 on base percentage and had a career fielding percentage of .988. He finished third on the team in average and hits (72), leading with 20 sacrifice bunts. He had two-hit games in an 8-2 win over Floria, an 8-3 win over the Gators, an 11-6 win over Michigan, a 7-0 shutout of Bowling Green, an 8-6 loss to Ave Maria, a 3-2 win over East Tennessee, a 13-5 win over South Florida, a 6-1 loss to Kennesaw State, a 3-2 win over USC Upstate, an 11-1 win over Jacksonville and a 9-6 win over the Stetson Hatters. Reeves had three-hit games in a 1-0 win over Manhattan, a 5-2 loss to Lipscomb, a 3-2 win over USC Upstate, including the walk-off hit, and an 8-5 win over Florida International. But his best came against the USC Spartans as he went 4-for-5 with his first triple of the year, a pair of RBIs in a 17-9 loss. Reeves earned College Sports Madness Atlantic Sun All-Conference First Team, was voted “best defensive catcher” and “catcher with the best arm” for his conference by College Baseball Insider. Reeves learned fundamentals from Peterborough coaches Bob Davidson and Steve Terry, moved on to play for the Ontario Blue Jays and coach Danny Bleiwas before joining FGCU and coach Dave Tollett, earned Canadian Baseball Network Second Team honours in 2012. First base: Simon Clarke (Kitchener, Ont.) Odessa Wranglers. Clarke hit .384, with 10 doubles, two triples, six homers and 42 RBIs. He finished with an impressive 1.044 OPS. He had two-hit games in a 17-7 thumping of Barton, a 15-0 win over Western Nebraska, an 8-5 triumph against Western Texas, a 5-4 win over Luna, a 5-2 loss to New Mexico JC, a 13-7 loss to Midland, a 10-0 setback to Midland, a 12-4 loss to Frank Phillips, an 8-5 loss to Frank Phillips and an 11-6 win over Howard. Clarke managed three-hit games playing Western Texas, in 16-1 and 16-3 wins, and in 7-5 and 14-6 wins over Frank Phillips. His best game was going 4-for-4 with two RBIS in a 14-1 win over El Paso. Clarke played for the Ontario Terriers and coaches Danny Thompson, Mike Tough and Scott Van De Valk. Second base: Michael Foster (Pickering, Ont.) Northeastern Huskies. Foster hit .282 with 17 doubles, four triples, five homers and 38 RBIs, starting 56 games at second. He had three hits, in a 12-5 win over George Mason, including two doubles and two RBIs, and three hits, including a triple in a 6-1 loss to Delaware. Foster had three RBIs including a triple, in a 10-3 win over Chicago State. Foster had a career-best four RBIs with a grand slam in the second inning of the 7-2 win over Villanova and was 4-for-5, with an RBI in a 6-5 win over Georgia State. He earned Colonial Conference All-Rookie Team honors and was a Second Team NEIBA All-Star. Foster played for the Ontario Blue Jays and coach Danny Bleiwas. Third base: David Head (Toronto, Ont.) Northeastern JC Plainsmen. Head hit .387 in 53 games with 17 doubles, one homer and 44 RBIs. He had two-hit games included a 12-5 loss to Southern Idadho, a 13-1 win against Northern Colorado, a 7-2 triumph over Western Nebraska, a 3-1 win against Otero, an 8-6 win over Williston State, the 8-2 victory over Chandler-Gilbert, a 3-1 win over Scottsdale, a 7-5 loss to Trinidad State, a 7-6 win against McCook, a 12-5 win over McCook and an 11-1 win over Western Nebraska. Head also had three-hit games in a 13-1 win over McCook, a 9-5 win against Phoenix (not the on-line school), an 8-3 win against Lamar and a 15-11 win over Lamar. His best game was a 4-for-4 outing in a 10-9 win over Otero in which he doubled and knocked in five runs. He earned All-Region IX First Team honours. Head, who played for Scott Van de Valk and the Ontario Terriers, earned Canadian Baseball Network Honourable Mention honours in 2012. Shortstop: Tyler Hayes (Calgary, Alta.) New Mexico Highlands Cowboys. Hayes finished the regular season with a team-high .410 average with 23 runs scored, 12 RBIs, four doubles, two home runs and 13 RBIs in 39 games. Hayes was 3-for-3 in a 12-8 loss to Metro State, had a two-hit game in a 10-3 win over Colorado Mines, had two more hits in a 7-6 loss to Eastern New Mexico and two more in an 18-9 win over Eastern New Mexico. He earned All-Rocky Mountain Conference Second Team honours. Hayes, who played for coach Les McTavish and the Vauxhall Academy Jets, plus David Robb of the Okotoks Dawgs, earned Canadian Baseball Network Honourable Mention honours in 2011. Outfielders: Brian Doran (Ayr, Ont.) Maine Black Bears, Tommy Muhlethaler (Edmonton, Alta.) Jarvis Christian Bulldogs and Jordan Mountford (Guelph, Ont.) Bryant Bulldogs. Doran batted .313 in 44 games, hitting 11 doubles, one triple, one homer and knocking in 23 runs. 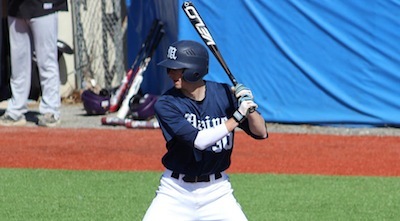 He hit a home run to give the Black Bears a 4-3 decision over the Binghampton Bearcats in the opener of the doubleheader sweep which gave Maine the title. Doran had a pair of hits in a 13-7 win over Chicago State. And he batted .300 against Stony Brook. He earned America East Second Team honours. Doran played summer ball for coach Chris Torres with the Old Orchard Beach Raging Tide, Steve Trimper with Maine as well as the Ontario Terriers and coaches Scott Van de Valk, Danny Thompson, Mike Tough and John McEwan. Muhlethaler batted .358 in 49 games with 11 doubles, six triples, a homer and 43 RBIs, while going 14-for-18 on the base paths. He had two-hit games in a 14-10 win over Southwest Nazerene, a 13-6 loss to LSU Alexandria, a 10-6 win over Arlington Baptist, an 18-12 victory against Southwestern Assemblies of God, a 5-1 win against Texas College, a 2-1 victory against Texas Wesleyan, a 6-4 loss to Central Baptist, a 3-2 loss to Bacone, an 11-7 loss to Bacone, a 9-5 win over and a 4-2 victory against Southwest. He was 3-for-3 against Texas College a 9-7 loss, a 12-7 win against Huston-Tillotson, a 19-1 win over Wiley, an 8-1 win against Southwest and a 7-5 victory over Bacone. Plus, he was 4-for-4 with an RBI in a 7-0 win against Southwest. Muhlethaler played Allan Hancock College and the Edmonton Cardinals for coaches Rod Scammell, Sean Cooper, DrewBoyer and Dave Muhlethaler, who was with Canada’s national team in 1979 and 1983. Mountford hit .317 with 17 doubles, three triples, three homers and 22 RBIs for Bryant. He was also 16-for-18 stealing bases. He saved his best for the post-season play, earning tournament MVP honours after Bryant blanked the Sacred Heart 8-0 to win the Northeast Conference. Mountford was 10-for-19 with six RBIs, four doubles and a triple. Bryant won the hard way losing 7-2 to LIU Brooklyn in the opener, beating Monmouth 11-1, LIU Brookyn 16-1,and Sacred Heart 6-3 to reach the final. Besides winning MVP honours, he also found a spot on the all-tournament team. Mountford played for the Ontario Terriers and coaches Scott Van de Valk, Danny Thompson, Mike Tough and John McEwan. DH: Cooper Langley (Edmonton, Alta.) Hutchinson Blue Dragons. Langley set a school record 20-game consecutive-game hitting streak with an RBI single against Hesston College in a 6-3 victory to reach the milestone. He hit .532 (41-for-77) over the streak with seven doubles, three triples, three homers and 28 RBIs. The next game, he was hitless in a one-run win over Pratt. Langley was named player of the week twice in April and ended the season with a .388 batting average. Cooper had 11 doubles, three triples, four homers and 33 RBIs. He finished with an OPS of 1.062. He was named to the fist team all-conference region team. Langley played for Sheen Bromley and Mark Randall at St. Francis Xavier, plus coach Rod Scammell with the Edmonton Cardinals where he won a batting title. Left-handers: Clayton Isherwood (Van Anda, BC) San Jacinto, Blake Stewart (Delta, BC) Jamestown, Taylor Bratton (Oakville, Ont.) West Alabama, Jack Dennis (Scarborough, Ont.) California of Pennsylvania, Nick Fogarty (Thornhill, Ont.) Valdosta State, Sean Callegari (Richmond, BC) UBC, Tylr Lawrence (Belle River, Ont.) Garrett. Voting (first-place votes in brackets): Kellogg (50) 284, Regan (12) 157, Zastryzny 52, Isherwood 23, Stewart 19, Bratton 14, Dennis (2) 12, Fogarty 12, Callegari 7, Lawrence (1) 6. Right-handers: Ryan Thompson (Calgary, Alta.) Franklin Pierce, Mike Schnurr (Waterloo, Ont.) Erie, Rory Young (Adam Lake, BC) LSU-Shreveport, Brock Dykxhoorn (Goderich, Ont.) West Virginia, Matt Cook (Dresden, Ont.) Madonna, Jeremy Filipek (Langley, BC) Midland, Anthony Ricciardi (Toronto, Ont.) Alabama State. Voting: Cooper (20) 127, Black (17) 127, Hatt (7) 90, Pivetta (8) 50, Thompson 49, Schnurr (2) 39, Young (2) 36, Dykxhoorn (2) 25, Matt Cook (1) 10, Filpek (1) 10, Ricciardi (1) 8. Relievers: Bryan Pawlina (Courtenay, BC) UBC., Jake Marks (Brights Grove, Ont.) Maine, Andrew MacDonald (Toronto, Ont.) Elon. Voting: Fitzsimmons (41) 269, Moore (14) 167, Janisse (4) 75, Pawlina (4) 42, Marks (2) 15, MacDonald 10. Catchers: Brooklyn Foster (Langley, BC) Canisius, Robert Tavone (Whitby, Ont.) Urbanna, Nick Drews (Lundar, Man.) Winnipeg, Mitchell Beaudreau (Dartmouth NS) Frank Phillips, Greg Densem (Toronto, Ont.) UBC, Chris Robinson (Uxbridge, Ont.) Morehead State, Larry Balkwill (Chatham, Ont.) Siena, Eric Cunningham (La Salle, Ont.) Wayne State. Voting: Procyshen (47) 261, Shaw (6) 142, Reeves (7) 54, Foster (1) 48, Tavone 18, Drews (1) 16, Beaudreau (1) 14, Densem 10, Robinson 6, Balkwill (1) 5, Cunningham (1) 5. First base: Alex Calbick (Burnaby, BC) Maine, Zach Ranta (Stoney Creek, Ont.) Genesee, Jim Martin (Ajax, Ont.) Union, Chayse Marion (Red Deer, Alta.) McNeese State, Alex Baldock (Ottawa, Ont.) Buffalo. Voting: Fagnan (42) 259, Edwards (15) 153, Clarke (2) 72, Calbick (3) 41, Ranta (2) 24, Martin (3) 16, Marion 12, Baldock (1) 7. Second base: Steven Todoschuk (Stoney Creek, Ont.) King, Chris Beer (Burlington, Ont.) Niagara CC, Daryl Blaskovich (Brentwood Bay, BC) Marshalltown, Patrick Vandoorne (Boissevain, Man.) North Dakota, Jacob Bannerman (Wasaga Beach, Ont.) Houghton, Pier Olivier-dostaler (Mont Carmel, Que.) Missouri Baptist. Voting: Black (26) 181, Firth (22) 171, Foster (11) 88, Todoschuk (3) 36, Beer (2) 35, Blaskovich 26, Vandoorne (1) 21, Bannerman 11, Olivier-dostaler 10. Third base: Phil Delisle (Lanoraie, Que.) Southeastern, Scott Wilcox (Burlington, Ont.) Western Kentucky, Johnny Caputo (Toronto, Ont.) Stony Brook, Connor Panas (Toronto, Ont.) Canisius, Khifer O’Connor (Pembroke, Ont.) St. Lawrence, Tanner Morache (Surrey, BC) Southern Idaho, Mattingly Romanin (Burlington, Ont.) Chicago State, Guillaume Gingras (Levis, Que.) Monroe, Mitch Holgate (Windsor, Ont.) West Alabama. Voting: Lutz (42) 228, McGibbon (5) 57, Head (4) 49, Delisle 48, Wilcox (6) 45, Caputo (3) 37, Panas (1) 23, O’Connor (1) 22, Morache 18, Romanin (1) 15, Gingras (1) 15, Holgate (1) 8. Shortstop: Robert Grilli (Mississauga, Ont.) Salt Lake, Brandon Collins (East York, Ont.) Genesee, Kyle Craig (Richmond, Ont.) Niagara County CC, Daniel Marra (Toronto, Ont.) South Dakota State, Thomas Rodrigues (Montreal, Que.) Niagara, Jordan Duffy (Fort Augustus, PEI) Maine-Presque Isle, Brandon Gignac (La Salle, Ont.) Alderson Broaddus. Voting: Popoff (28) 184, Peragine (16) 103, Hayes (8) 99, Grilli (2) 69, Collins (5) 53, Craig (3) 38, Marra (1) 10, Rodrigues (1) 9, Duffy 8, Gignac (1) 5. Outfielders:Byron Reichstein (St. Thomas, Ont.) Navarro, Andrew Ruck (Whitby, Ont.) Lafayette, Nathan Mastervick (Beamsville, Ont.) Jefferson CC, Phillippe Craig-St. Louis (Gatineau, Que.,) Seminole State, Brandon Sonnerberg (Surrey, BC) San Jacinto, Keenan Chanin (White Rock, BC) Tabor, Tosh Semlacher (Calgary, Alta.) Willamette, Mike Turcotte (Victoria, BC) Minot State, Derek Jones (Brampton, Ont.) Rose State, Mike Hole (Vancouver, BC) UBC, Tyler Hibbert (Unionville, Ont.) Florida International, Richie Seaton (Scarborough, Ont.) Cumberland, Mitch Davidoff (Victoria, BC) Central Christain, Aaron Palmer (Brampton, Ont.) Riverland, Colin Porter (Mount Hope, Ont.) Western Texas, Keifer Quick (Leamington, Ont.) Notre Dame Col., Erric Barnier (Port Stanley, Ont.) Jefferson CC, Adam Nelubowichch (Stony Plain, Alta.) Washington State and Conner Bowie (Ancaster, Ont.) Mt. Aloysisus. Voting: Forcier (47) 265, Baumi (32) 223, Miller (29) 205. LaGarde (16) 138, Gooch (9) 86, Cloutier (7) 77. Doran (7) 64, Muhlethaler (1) 63, Mountford (9) 61. Reichstein (6) 59, Ruck (6) 57, Mastervick (1) 57, Craig-St. Louis (2) 50, Sonnerberg (3) 40, Chanin (4) Tabor, 34, Semlacher (3) 33 Turcotte (3) 32, Jones (2) 32, Hole (1) 30, Hibbert (1) 13, Seaton (1) 13, Davidoff 12, Palmer 12, Porter (1) 11, Quick (2) 10, Barnier (1) 7, Nelubowich (1) 5, Bowie 5. DH: Brett Siddall (Windsor, Ont.) Canisius, Matt Benn (Teulon, Man.) Colby, Greg Friesen (Regina, Sask.) LSU-Shreveport, Boston Langley (Edmonton, Alta.) Rollins, David Marcus (Whitby, Ont. California University of Pennsylvania. Voting: Telford (33) 188, McCallum (15) 129, C. Langley (5) 112, Siddall (8) 82, Benn (3) 82, Friesen 8, B. Langley 7, Marcus (1) 5.